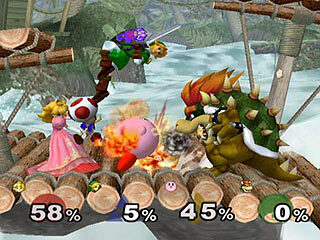 When a sequel to the highly entertaining Super Smash Bros. was confirmed for GameCube a little before the beginning of the E3 2001, people were stunned, delighted, and terribly excited to see the first pictures. It was the surprise title of the show and for many visitors, it was the best of the show. 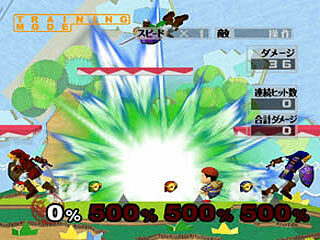 Since then, the enthusiasm about Super Smash Bros. Melee never weakened: it's been a success everywhere it was released and it keeps selling well; the game surprinsingly appeared in the top 50 of best selling video games in Japan during one week in January 2003, 15 months after its release ! 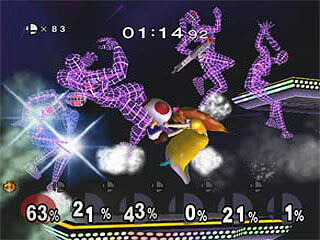 Not everybody likes Smash Melee though, some persons hate its fighting system, they say it's not enough "pro" for them, it's a messy brawl with not technique. 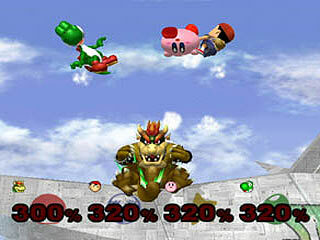 Unfortunately, that's not a very good excuse as SSBM is one of the most challenging games. There's an amazing amount of things to do and some are very, very difficult, real "pro" should be delighted. To finish or master the hardest levels is not something anyone can do: it requires practise and skills. 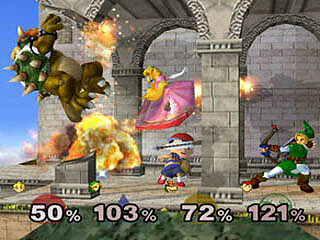 Anyway, gaming expert or simple player, Super Smash Bros. Melee will satisfy everyone thanks to the extraordinary diversity of modes. There's always something new to do. Let's visit the game's menu to give you a glimpse of its considerable extent. 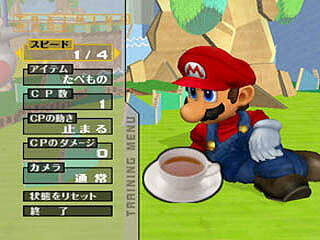 SSBM is made of 5 main menus. The first one is 'Data', to check the snapshots you took, a turorial, all your stats and records, and a diary of the main events of the game. The second one is 'Options'. The third one is 'Trophy' where you can see and learn in details about all the trophies you'll earn (about 300). Fourth one is the 'VS. 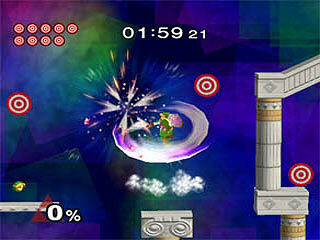 mode' to access all the battle modes including Tournament and Special Melee (10 different modes !). 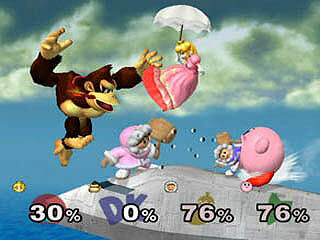 You can then choose to play by team or not according to one of the 4 key rules (time, stock, coin and bonus). 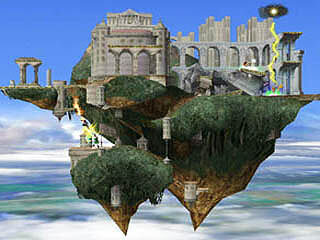 The fifth one, ultimately, is for a single player and divided into four modes: training, stadium (targest test, home-run contest, multi-man melee - and this last one has 6 different modes ! 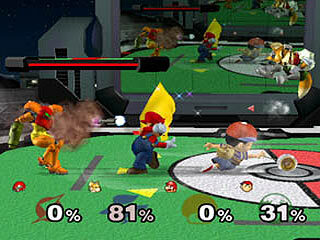 ), event match (more than 50 scripted fights) and regular match. 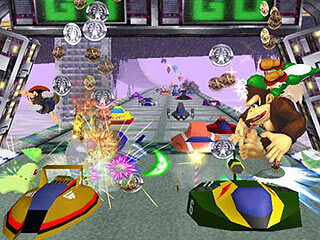 Regular match being the main 1-P mode: classic, adventure and later, all-star, all of them with 5 difficulty levels. Knowing that you can play any modes with one of the 25 characters and even play with your own name, knowing that 30 stages of all kind and style with plenty more great musics await for you, knowing that you'll get something new almost every time uou play, knowing all this, well, it should be easier to figure what a hell of a game is Super Smash Bros. Melee ! Of course, the graphics are terrific, the animation is even better, it plays fast and like a dream, and the fun is very, very high. Almost perfect. Almost, yeah... who or what is perfect, huh ? 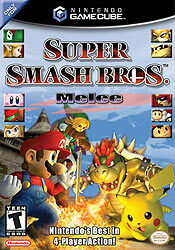 It deserves a 10 though, because so far no other game on GameCube has delivered such a rich content. When you see the endless credits (very well done too), it's clear that it's one of the biggest Nintendo's production ever. Too bad Nintendo seems to prefer now to spend less time on the making of its games, rare are the titles to have so much to offer for so long. Beside the main idea of the game which doesn't appeal to everyone, the other drawbacks are the computer A.I. 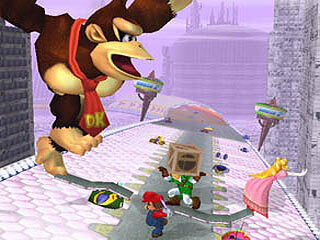 which is sometimes frustrating because it always focuses on attacking the leading player, and eventually boredom, after many many many hours of play, because due to its system which is based on fighting over and over, at some point, you can't escape it. 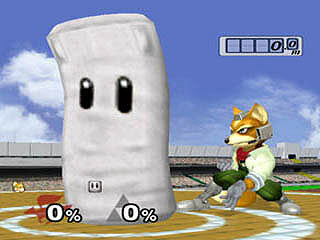 However, Super Smash Bros. Melee is a king in his kingdom, there's everything you can expect and more, everything is polished near perfection. So, no wonder that the same conclusion I was using in the comment before writing this review comes to my mind: "SSBM is a sheer wonder and an unbelievable work that everyone who owns a GameCube must possess. Years of fun ahead !" It couldn't be more true, if no sequel comes, in 10, 20, 30 years or more, you'll still be playing it. 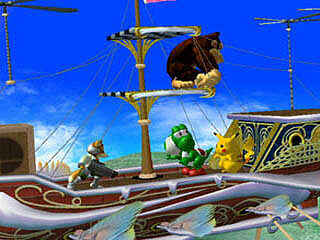 "Super Smash Bros., the smash hit for the N64 from Nintendo, returns in a new dazzling form for Nintendo GameCube called Super Smash Bros. Melee. 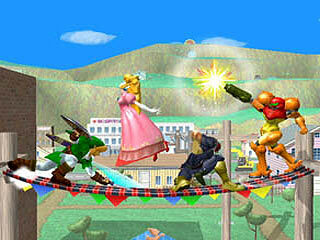 Up to four players can enter the brawl, commanding their favorite Nintendo characters and using lots of new moves. 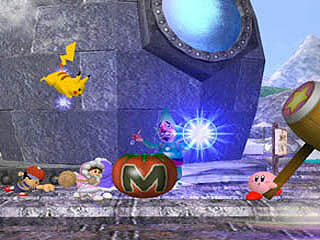 The E3 version of Super Smash Bros. Melee features the return of many familiar fighters, such as Mario, DK, Link, Yoshi, Ness, and Pikachu, and introduces new characters, too. There are new powerful items, new modes for rookies andveterans, tournaments for up to 64 players, new fight stages, new camera controls and an option to take snapshots that you can review. 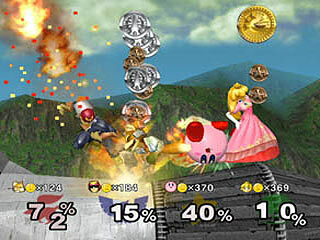 Players will feast on cinematic introductions, a new one-player mode, rules that can be bent, battered and broken and even several mystery modes, such as the Homerun Contest. 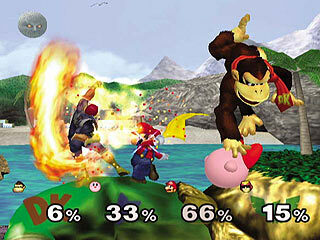 Lucky show attendees have been able to experience the fun of Super Smash Bros. Melee the best way possible: by bringing along a friend and going head-to-head. 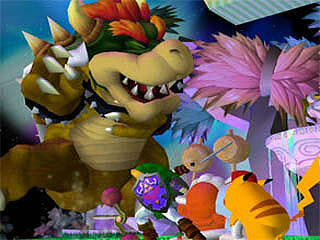 It's crazy and challenging at the same time -- and that's the Smash Bros. difference." + 5 secret characters and more ! + 5 secret levels and more !" Love this game. Pure perfection. I love it a lot, it's so totally cool. I give it five thumbs up (if I had that many). Cool as hell, two thumbs up. 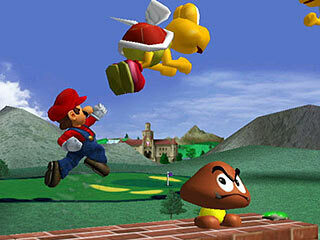 I've always been a fan of anything Mario and this game is no exception, it's probably the best game I've ever played.